Imagine a room so special that it was dismantled, packed into 27 crates, and floated across the ocean. 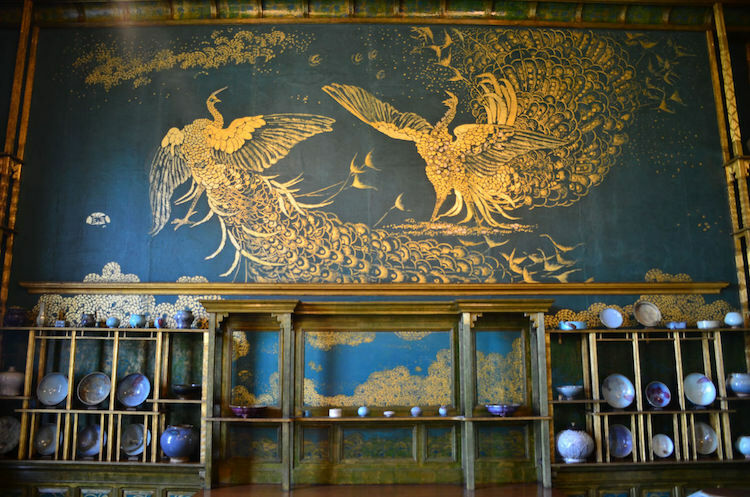 In 1904, that’s just what happened to The Peacock Room—a decorative masterpiece by heralded American artist James Abbott McNeill Whistler. You might be wondering What makes this room so intriguing that it was floated across the Atlantic from England to America? Well, the Peacock Room was originally designed as a dining room for British shipping magnate Frederick Richards Leyland and is considered an excellent example of the Japonism that pervaded late-19th century Europe. Originally entrusted to British architect Thomas Jekyll, the room was designed to show off Leyland’s impressive collection of blue and white Chinese porcelain. Jekyll covered the walls in 6th-century wall hangings and created the open latticework shelves that would hold Leyland’s porcelain collection. After Jekyll was forced to abandon the project due to illness, Whistler came on-board, and that’s when things got wild. With Leyland out of town on business, Whistler used his creativity with abandon, even going so far as to paint the precious wall hangings. Whistler did so to ensure that his painting, Rose and Silver: The Princess from the Land of Porcelain, remained the focal point of the room and didn’t clash with the red Tudor roses on the wall hangings. Leyland, shocked by the changes, fired Whistler from the job and they had a bitter feud over payment for the work. At some point in the midst of their issues, Whistler was able to gain access to the room and while there, he painted two fighting peacocks. Meant to represent the artist and Leyland, they were his final word on the project and fittingly titled Art and Money: or, The Story of the Room. Completed in 1877, the stunning gold and blue interior, with all its refinement, left Whistler with the last laugh. In 1904, it was purchased by American industrialist and collector Charles Lang Freer and shipped to the United States, where it was reassembled in Freer’s Detroit home. 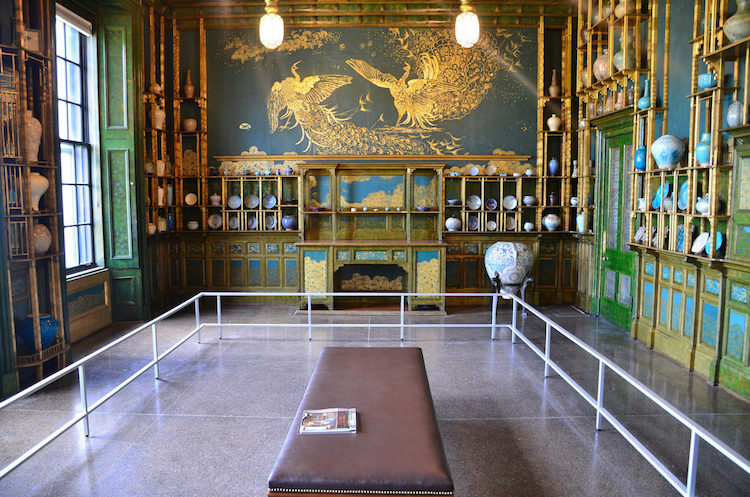 He filled the shelves with his rich collection of ceramics from Asia and the Middle East. 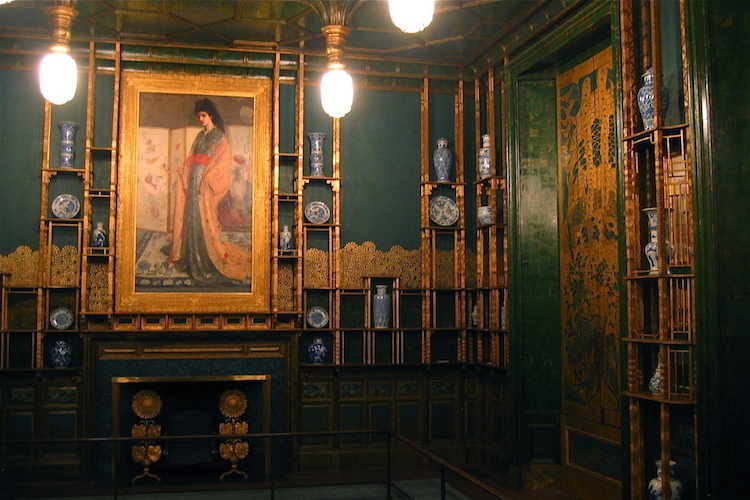 After Freer’s death, the room was donated to the Smithsonian along with a large part of his art collection. It now sits in the Freer Sackler Gallery in Washington, D.C. In 2011, curators spent months using archival photographs to replicate Leyland’s original installation of ceramics. 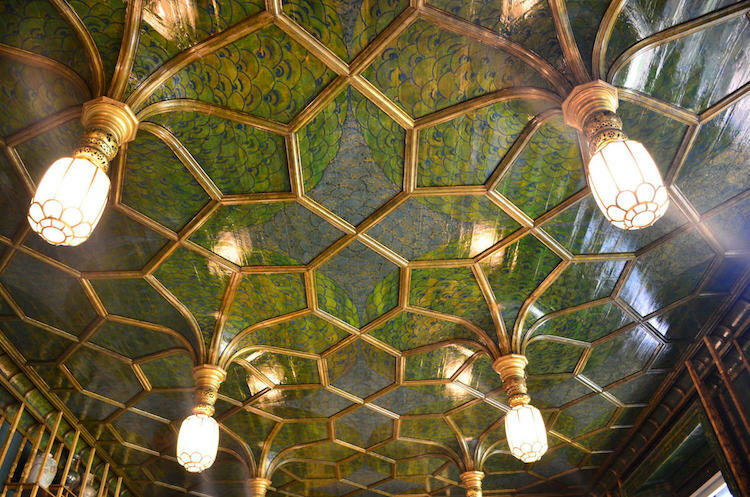 Now, the Peacock Room’s shelves are once again filled with spectacular ceramics. And once a month, the room’s shutters are open to allow natural light to spill into the space, illuminating the colorful collection. The Peacock Room is a blue and gold, 19th-century masterpiece now located at the Smithsonian’s Freer Sackler Gallery. 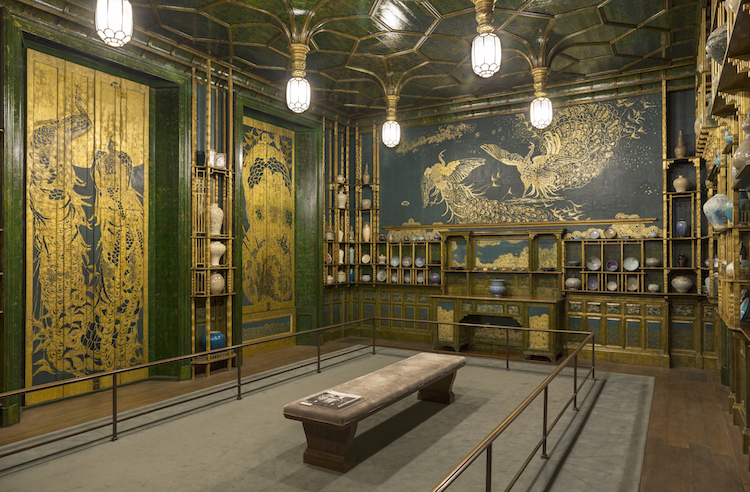 Learn more about how curators painstakingly recreated The Peacock Room’s function as a showcase for ceramics. The post This Golden ‘Peacock Room’ Is a Masterpiece Transported Across the Ocean appeared first on My Modern Met.